B&H has put together this Genaray Box Lighting 36" Soft Strip 4-Light Pro Kit with C-Stands which lends itself to triangular or box-like configurations or use as a hair light or accent light, offering image-makers a way to create a signature look with the help of this unique source. The kit includes four 5600K lights that have a CRI of 95 and a TLCI of 98.3. Each 36" strip light comes with barndoors, a dimmer control box with V-mount battery plate, and four C-stands with removable bases. 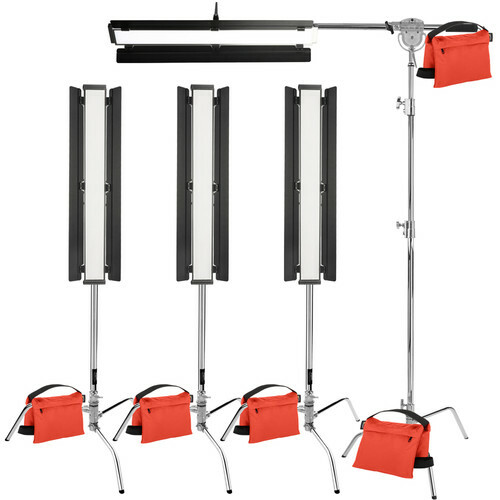 A 7.2' boom arm, which can support up to 8 pounds, is included, while five sandbags are also included to stabilize the stands and fixtures. Offering 256 bright LEDs with a soft wrap-around quality thanks to its long, narrow form factor, the 36" long Soft Strip LED Light from Genaray is a versatile fixture with features easy to use in the studio or on location. The light has color temperature that's a solid, daylight-balanced 5600K with a high CRI/TLCI rating of 95/98.3, an indicator of precise color rendering. Light intensity is conveniently variable from 10 to 100% without flicker, avoiding moving the fixture back and forth to achieve the desired illumination level. The SSL-36 runs barely warm to the touch, allowing you to work close to the subject without causing discomfort or hot light hazards. The power-saving light produces an output of 977 lux at 3.3' while consuming just 56W of power, ensuring a fast return on investment. The long, narrow fixture can be used vertically or horizontally. In vertical orientation, the SSL-36 is ideal for use as a sidelight or for dramatic lighting. It also creates long, elegant reflections when shooting products. It horizontal mode, the light has a wrap-around quality with appealing falloff at the top and bottom of the frame. Another use is overhead as a hairlight. The SSL-36 has a beam angle coverage of 60 degrees which can be modified and controlled by its 2-way barndoors. The fixture comes with a multi-voltage adapter that makes it ready for world use, but it can also run on optional V-mount batteries when AC power is unavailable. A case is included to store and transport the light. The long, thin form factor gives a wrap-around quality when used horizontally. Used vertically, it's well-suited for a sidelight or for lighting objects and casting a long, elegant reflection. This simple but effective modifier allows you to swing one or more leaves into the light's beam for selective lighting of your subject. The mount incorporates a ball head attachment that allows fine-tuning of the light's positioning. The SSL-36 ships with a multi-voltage 100-240 VAC power supply but it can also run on V-mount batteries when mains power is unavailable. The SSL-36 provides even illumination along its 36-inch length, without noticeable hot spots. When shooting full-length portraits or group shots, this fixture bathes your subjects in soft and diffuse wraparound light without multiple shadows. The SSL-36 runs barely warm to the touch allowing you to work close to your subject without discomfort and without losing time waiting for the fixture to cool down. The light features 10 to 100% dimming to adjust the output without moving the fixture back and forth. The light's fanless convection cooling is a valuable asset in sound-sensitive environments. Designed for overhead lighting, this chrome-plated steel Boom Arm from Impact telescopes from 46 - 86" and supports up to 8 lb at maximum extension. Features include a ratcheting pivot clamp handle and rubber-coated section above its counterweight hook for comfortable, secure height adjustment. The boom has a 5/8" receiver and is an ideal match for heavy duty wheeled stands like Impact's LSP-SW10 9.5' Steel Roller. This chrome-plated, 5.9' Impact Turtle Base C-Stand features a patented locking mechanism that allows the legs to swing out and lock into place for easy setup and collapse flat for storage. The stand has a low center of gravity which allows mounting of heavy equipment without tipping. The legs are perfectly shaped for saddlebag-type sandbags. A light head can be mounted to the base directly with the aid of an optional stand adapter. The base allows individual legs to be set at any angle, and can be positioned in locations not possible with standard design stands. Made of thick, weather- and water-resistant Cordura nylon, the 15 lb Impact Filled Orange Saddle Sandbag is a staple in studios or on location for stabilizing light stands, booms, tripods, and backgrounds. The bag features rugged and durable assembly throughout. A double-zipper design is employed for safe containment and removal of the sand, as well as a webbed handle for hanging or moving. Box Dimensions (LxWxH) 40.0 x 5.1 x 5.1"
Box Dimensions (LxWxH) 53.0 x 14.0 x 3.0"
Box Dimensions (LxWxH) 49.0 x 6.5 x 5.5"
Box Dimensions (LxWxH) 33.5 x 14.0 x 3.2"
Box Dimensions (LxWxH) 10.5 x 10.5 x 8.0"
Box Lighting 36" Soft Strip 4-Light Pro Kit with C-Stands is rated 4.8 out of 5 by 6. Rated 5 out of 5 by James from Better than expected I wanted to replace to old softbox lights that I use for educational videos, bought two of these Genaray 36" soft strip light, ( instead to a DIY LED from Home Depot). I have done two sessions, and just love these lights, for me, great quality of light, ( 5600K) and very nice consistency. The build is excellent, the bar doors work well, and candidly there is a sense of overall quality and design that one gets when using the product. Rated 5 out of 5 by Sean from Creative Lighting and Catch lights So far this light has been great, high quality light color and bright output. The build is solid and I always appreciate when a light comes with a case. It fits everything you need so thats a plus. The mounting arm (lollipop) allows you to angle the light how you need it so it gets way more useful then just tilting it up or down. The barn doors are there, the diffusion is there so all you need is a V-mount battery and you are good for on the go shooting. This sounds small but I really like the way the power brick clips on the V-mount adaptor. This eliminates having the power brick dangling when using AC power. If you have two of these, you can really use these in a creative way for portraits or video. You can use it a more traditional way or you can get creative and get really unique catch lights with portraits or get a really nice stylized background for music videos. This light gets an A++. If you get one I would suggest getting a set. Having two will open up a lot more possibilities. Rated 5 out of 5 by Eric from A Ton Of Light From Subtle To Extreme So once again I am floored by the outstanding quality of Genaray lights. Like the other reviewer said here, it comes with a bag like many of Genaray's lights which is a bonus for travel. Just unboxing and opening this light I was sold on it before I even plugged it in. You see and feel the quality on this unit. Heavy solid construction, nothing overlooked when it comes to durability, ease of use and also safety (as it's quite heavy) I have not used a Lollipop mount to this point and was surprised how easy it was to assemble and adjust. The light can be practically spun in 360 degrees when it comes to mounting and positioning it. Like other Genaray lights I own, variable output from 10% to 100% is the same here. A little light or see me from outer space light, the Genaray 36" Soft Strip Led light will get the job done again and again. My 1st try using the light was positioned high up on a sturdy light stand (you'll want a solid stand for this light, again, it's fairly heavy). Probably about 7 feet in the air, in a horizontal position. I used this to illuminate my green screen background and it did it perfectly and my chromakey work has never been easier! I agree with the other review here too on a couple points: - good for both video and creative portrait work - getting a second one to use as a pair is something that would be a good investment and will yield stunning results. The only negative I will say is why did it take me so long to discover Genaray? I am a musician as well as a photographer & video creator. I value my Genaray lights as much as I do my most expensive musical instruments. And just like those instruments when I do a job, I know I can count on them. And when it comes to my lighting needs, I know I can count on Genaray. Highly recommended! Rated 4 out of 5 by Walter from Beautiful wrapping or directional light This is a great light to add to a kit of various LED lighting tools. I did not give it a 5-star because the power supply is a bit awkward. Once you understand why it was designed the way it is, it make sense, but the engineers solution is not what you find on other LED lights. Rated 5 out of 5 by Hunter from Great versatile lighting! I picked one of these up when it was on sale just to give it a try since I was looking for some good continuous lighting. I must say this light offers a great variation between subtle and powerful light that seems to always be nice and soft. The barn doors let you do some really creative shots that can be altered by rotating the light in vertical, horizontal, and diagonal positions. the 6 light pack says it only comes with 2 ac adapters. I am hoping this is wrong and it comes with 6. Is this the case or do I still need 4 more ac adapters? The kit options for this light will come with one AC adapter per light. does this come with carrying case pictured in description? what it the light stand the video guy is using for the over head placement. I want to purchase this as well Looks like some type of boom arm with a weight.? We've got a boom and it works with a decent size counterweight. Can't tell you which one the guy in the video is using, sorry. You'd need a solid boom.